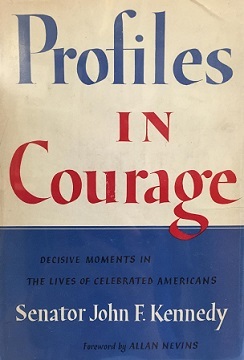 Of Profiles and Courage | "Northern Crossings"
John Kennedy supposedly wrote a book about Senators making extremely difficult decisions that went against their party or their constituents, and were extremely controversial at the time. He wrote it supposedly when he was a junior Senator and it won a Pulitzer. Those things meant something back in the day and the book is still considered a classic. It was so well known that when Kennedy was President and history had not apotheosized him Eleanor Roosevelt was reported to have said he needed “less profile and more courage”. I thought of the women Senators that we have up here in the North Country and I have been amazed at the reaction to the Supreme Court nomination. The Senator that actually sits on the committee said that she would vote against him before any hearings were held and when the smear campaign went forward she used his anger towards it as a reason to vote against him. The Senator from North Dakota said she didn’t believe the nominee. This is all from the backdrop of another Senator who happens to be a women, who underwent bribery attempts and threats before the vote and used those as one of the reasons for voting for the nominee. She stood before the world and explained with reason, prudence and courage why she would vote for the nominee. She is of course now receiving death threats and vile attacks from those who claim to “take the high road”. She is also under attack by huge amounts of money coming into a campaign chest, some of which is probably illegal, but as the past few weeks have proven, legality, let alone decency means nothing. Our Senator on the other hand has, by my count, about 16 TV commercials every two hours somewhere on TV and many commercials on the radio. Interestingly, she was able to put a commercial out on TV the day after the Senate vote which makes me wonder; had the ad been filmed, produced, edited, and put, as they say “in the can” along time ago, since the accusation by the Doctor in California had been known by the Democrats for at least six weeks. I don’t know what a TV ad costs but there are times when the North Dakota Senator’s face and voice are on the same ad back to back. That is a lot of profile. Her explanation for her vote is short on courage. Perhaps she could take some of the money she spends on ads and reimburse the State of North Dakota for the mess that paid “Rent a Mobs” made in their protest of the pipeline down on the Cannonball River. Those protests were paid for by the same folks that paid for her ads and tried to bribe Senator Collins. The Senator from Minnesota has a lot of profile as well. Maybe she can exhibit some courage and bring up the issue of Keith Ellison and publicly talk about his “demeanor”. Something tells me that will never happen and that folks who bring up “unsubstantiated” charges and might protest at his run for Attorney General will be called vile and outrageous. Of course screaming at people in restaurants and sending thousands of coat hangers to the offices of Senator Collins and praying that she gets raped are free speech. And so it goes when elected folks gets some profile but have no courage. Think of it, the national news finally figured out who a North Dakota Senator is. Up until Trump was elected our TV facetime female Senator was often referred to as the “Senator from South Dakota”. I wonder what the South Dakotans thought about that. I will get questions about why a blog that is supposed to be about mercy and the connections that folks have up here in the North country would go on about profiles and courage and politics. Well it might have something to do with the way politics corrupts even mercy work that churches organize together to do and once they get involved in Government grants they become hostages and they become political and sometimes go against the morals and the wishes of the folks that supported them. Lutheran Social Service agencies were one a gem across the country as they brought mercy and care to thousands. Once the politicians get involved bad things happen but I might have to get some courage before I can write that profile. The same can be said of the mission field and that fact that politics can corrupt not only the work, but shut it down altogether. That is going to take some courage to explicate as well. I will be taking John Kissinger to the airport this morning as he begins his flight back home. I got to visit with him on 2 car journeys and 2 nights of lodging at our home. I saw his presentation at Trinity-First, Minneapolis, where daughter Julie teaches and the MNS Pastor’s conference. His two weeks went by quickly.